In the spring of 1974 on a warm Saturday in Anchorage, my husband Mike and I took our daughter Nikki for her first visit to "Valley of the Moon Park." The above video was primarily shot at the Valley of the Moon park in Anchorage. It was shot and edited by Michael R Dougherty and engineer Joe Gill as part of a KAKM channel 7 series called "Southcentral". Because one big piece of the playground equipment in Valley of the Moon park was shaped like a rocket ship, we gave the park a brand new name, we called it "Rocket Ship Park." On that warm spring day it was exciting for Mike and I to take our daughter for her first outing at the park. Nikki was six months old and we had to carry her everywhere at the park. As parents we got quite a work out! A fun time for Mike and Nikki was when they climbed the rocket ship. They had a blast. Being a first time parent I shouted out as I looked at them way up on the rocket ship, "Be careful." Next, Nikki held on to me as we jogged around the park. We laughed at how funny we felt bouncing along on the grass. Mike and I had fun with Nikki and as we walked around the park, we pointed out birds, trees and other children to our daughter. Whew, lunch time and nap time called for all three of us after all that climbing, jogging, laughing and walking. That was just one of many, many visits we made to "rocket ship park" over the years. Now we like talking to our now grown up daughter about that day and remembering all the fun that we had. In 1955, The Municipality of Anchorage purchased the land for Valley of the Moon park from Grace Gay. The park, located at 610 W. 17th Avenue was named Valley of the Moon, the Indian name for Sonoma Valley in California. The place where "Call of the Wild" writer, Jack London lived in his later years. Check out this fun story, Go Home Kids, Halloween is Tomorrow right now. I grew up at 1551 H street and my mother still lives there. Anyway, before the opening of the park, us boys would sneak in at night and weekends and play. One day Ricky Vancleave and myself were hanging on the propellers of the helicopter when a Times newspaper photographer took our picture and it ended up in the paper. I don't remember the date, I wish there was a way to find it. Anyway, Moon Park was a large part of my childhood. I am still recuperating from all the hard work Mike made me do. Great video, Mike! Always great to hear from you Joe. For our readers, Joe was the engineer who went on all the KAKM channel 7 shoots with me for the TV magazine show "Southcentral." Joe was connected to me by a big cable and he had to follow me into a lot of odd situations. In the "House on Pooh Corner" video that we shot at the Valley of the Moon park and others, Joe had to help me come down the park slide with the camera rolling. It was a lot of work, but the video came out really well, in large part due to Joe's hard work. The "Rocket Ship" park is a great memory for our family. 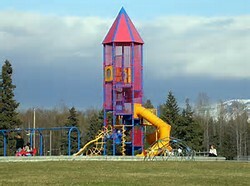 Our children loved going to "Rocket Ship" park and still have fond memories of spending time there. I shot several videos in that park for "Southcentral" the television magazine show that aired on KAKM channel 7. Later, when our son Christopher was in Junior High school at Romig, I shot a video with him as the host at the "Rocket Ship" park for KYES channel 5's kid's show previews. Yes, the Valley of the Moon Park is a very special place for Anchorage families.